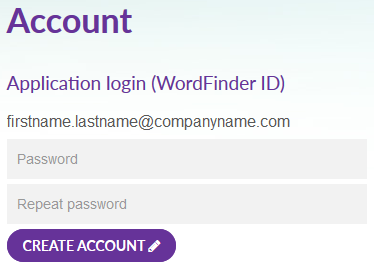 As a user with a federated account using SAML, you will access WordFinder Online with the username and password and link provided by your organisation. The link will look like this: app.wordfinder.com/federationlogin?idp=YourOrganisation. When you access WordFinder Online for the first time no dictionaries are selected. 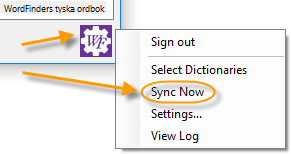 You select the dictionaries you want to work with by clicking the Settings-menu (the cog-wheel) and then Dictionaries. For more information about the search functionality in WordFinder Online, please see our video about WordFinder Online and our Quick Guide. To use these applications you will need a WordFinder ID, which is made up of your email address and a password of your choice. You will use this WordFinder ID when you set up these applications for the first time. How to create a WordFinder ID? If your installation requires an upgrade or you do not have WordFinder Pro for Windows installed, please see the section “Get WordFinder Pro for Windows” below. 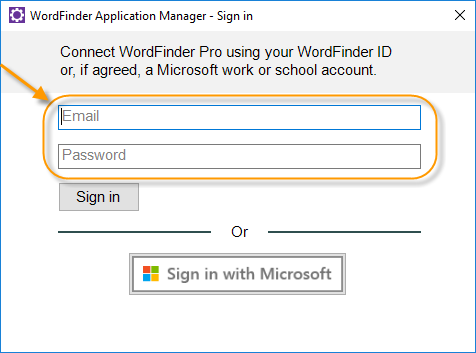 Sign in with your WordFinder ID in the WordFinder Application Manager sign in dialog, which will pop-up the first time you start WordFinder Pro for Windows, please see the screen-shot below. This section is split in two parts, one covers the case where you are allowed to install software yourself and the other covers the case where your IT-department does the installation of software. Before downloading and installing WordFinder Pro, please login to WordFinder Online (see the section above) and select the dictionaries you want. You need to download and install a new version of WordFinder Pro, please follow the steps below. If you need assistance, drop us a support request in the form to the right. IMPORTANT: As always before you do any changes to the WordFinder installation, please make a backup of any dictionaries you’ve bought from us and any dictionaries you have created yourself. Always keep such dictionaries in a separate folder from the dictionaries you subscribe on, e.g. in a sub-folder to your Documents folder. IMPORTANT II: If you have a current WordFinder Pro installation, please verify that there is NO login information entered in the setting (Tools/Verktyg -> Dictionary Management/Lexikonhantering -> Online dictionaries/Online lexikon -> Settings/Inställningar). If there is please REMOVE IT. Restart your computer to make sure no old WordFinder applications or tools are started. Download and run the WordFinder Installer for Windows. Login in WordFinder Application Manager. All dictionaries you selected will be downloaded. Before launching WordFinder Pro, please login to WordFinder Online (see the section above) and select the dictionaries you want. Double click the WordFinder Pro icon on your Desktop or in the Start-menu. WordFinder Pro will start, stating that no license file is present and ask you to login. Login in WordFinder Application Manager. All dictionaries you have selected will be downloaded. Before downloading and installing WordFinder Pro, login to WordFinder Online, please see the section above and select the dictionaries you want. IMPORTANT: As always before you do any changes to the WordFinder installation, please make a backup of any dictionaries you’ve bought from us and any dictionaries you have created yourself. Restart your computer to make sure that all WordFinder applications or tools have been shut down. Download and run the WordFinder Installer for Mac. If you are upgrading an old installation, please open the Preferences dialogue and verify your username and password and click “Check now”. If you are doing a new installation the preferences dialogue will be presented and ask for your username and password. The dictionaries you’ve selected will be downloaded.